So by now you’re able to identify the physical sensations, thoughts and emotional states that arise when your sweet tooth goes into overdrive. And you’ve given a go at just observing these sensations, with acceptance and curiosity, and without reacting to them or trying to change them in any way. You’ve also probably noticed that sometimes, it’s really hard to do this. Sometimes the craving for something sweet seems to overwhelm your capacity to observe it non-reactively. What I’ve shown you in this series is a straightforward way of being mindful of your craving for something sweet. Once you get good at it, you’ll find that wanting to eat something with sugar in it stops being such a big deal. You’ll no longer experience sticking with a sugar free diet as a struggle, or an exercise in will power. You’ll no longer even feel like you wish these cravings would go away. Your relationship with these cravings will begin to transform. A lot of tension around this area of your life, both physical and mental, will be released. It’s a pretty nice feeling! But all this takes practice. It’s not going to happen overnight, and you’ll probably cave in a bunch of times during the process. When this happens, it’s important to give yourself some slack. Don’t beat yourself up about it. Just take it as a sign that you need to keep practicing. Try to keep things in perspective. And if you’re serious about this and you want to really turbo charge your ability to non-reactively observe these kinds of cravings, then the best thing you can do is to set aside some time to meditate each day. Even 15 minutes of daily mindfulness meditation will really help you learn to accept and be curious about the physical sensations, thoughts and so on that you’ll encounter while trying to stick with a sugar free diet. It lets you practice this kind of mindful observation on easier things and allows you to very efficiently develop enough skill so you can apply it to situations like I’ve been talking about in this video series. If you’re new to mindfulness and would like some straightforward, easy to follow instructions on how to get started, you may be interested in a Free short video and 15 minute guided meditation I put together for beginners, based on my 20+ years of meditation experience. I hope you’ve enjoyed watching this series as much as I’ve enjoyed making it for you! If you know someone who’s been struggling to give up sugar, or struggling with food cravings in general, then this series of videos could be very helpful to them. Feel free to send them an email with the link to this post. Just highlight the red URL below it and copy it. Then paste it into your email. 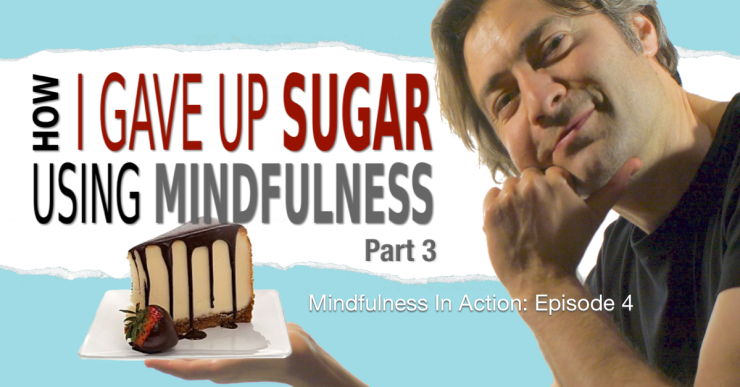 Thanks for joining me for part 3 of this series where I show you how you can use mindfulness to help you stick with a sugar free diet. If you haven’t watched part 1 and 2 yet, I recommend you do that first, and then come back to this video. Well, I’ve got a little secret to show you that can help you a lot in these situations. You know all those sensations, thoughts and so on that tell you that you are craving something sweet? Lean in a bit and I’ll whisper it to you. Let me say that again a little louder. Those sensations, thoughts and emotional states don’t last. They’re transient. >> [Looking around where is the voice] ASIDE: Well, Duh Nick. Everyone knows that. Some secret! Now, before you think I’m just playing around with you, let me explain a little more what I mean. If you think about it a bit and reflect on your own experience, it’s probably pretty obvious that sensations, thoughts and so on are just temporary phenomena. They come, hang around for a little while, and then disappear. When you’re gripped in the moment by a strong desire for some sweet stuff, such as my favourite chocolate, it’s really easy to completely forget this basic fact. In that moment of craving, these intense sensations can seem like they’ll last forever, unless we act on them in some way. After all, that’s the reason we act on our desires in the first place: to escape from these intense sensations, to make them stop. But, if we don’t act on them, these sensations go away all on their own, so there’s actually no need to do anything with them! I’ve noticed that when I get a sugar craving, as long as I don’t do anything to act on it, or try to suppress it, that craving usually lasts somewhere between 3 to 5 seconds. That’s it. If I know that something’s only going to last about 3 seconds, I can handle a pretty intense dose of it without feeling the need to act on it. And I bet it’s the same for you. So, the next time you get a hankering for some sugar, what I want you to do is pay attention to how long that craving actually lasts, when you observe it without reacting to it in any way. Treat it like a science experiment. I bet you’ll be surprised at just how fleeting these sensations are. The more you observe the transient nature of these sensations, the less of a big deal they become and the easier it will be for you to remember this little secret the next time a craving hits. Now, if it seems like the sensations just keep building in intensity and keep going for longer than a few seconds, it means that you’re probably fuelling that desire in some way. Either by trying to suppress it, or engaging with it, like imagining yourself eating the stuff, imagining what it would taste like, arguing with yourself about why you should or shouldn’t eat it, and so on. When you’re observing the sensations associated with the craving, see if you’re holding any tension in your body. If you are, that tension is usually a good indicator that you’re resisting the sensations to some degree. For example, when I’m resisting my sweet tooth cravings, I usually experience it as a slight tension in my diaphragm and abdominal area. That’s my clue that I’m not actually accepting my experience fully. You need to discover where that tension is for you. If you notice this kind of tension, allow it to relax if you can and open up to more fully accepting the sensations associated with the craving. See if you can treat them the same way you would treat a totally neutral sensation, such as the feeling of your finger tips typing on a keyboard or something. After all, whether the physical sensations are those associated with a sugar craving or something completely neutral, they’re both just sensations. There’s no need to act on them if you don’t want to. So treat them as such. Ok, one last thing before this video wraps up. It lets you practice this kind of mindful observation on easier things and allows you to very efficiently develop enough skill so you can apply it to situations like I’ve been talking about in this video. So, go ahead and time those craving sensations and post a comment below letting me know how long they last for you. It’ll be really cool to discover and compare what everybody finds. And try to meditate for 15 minutes each day for the next week and see how much that helps you stick to your diet. Also, if you know someone who’s trying to quit sugar, or is struggling with food cravings in general, send them an email with a link to this video and pass it along. It could really help them. I was looking for some information about giving up sugar, when I came across your site. I have to say, great stuff – so happy to hear that more and more people are spreading the word about this sweet drug! I am actually a fitness coach, and I recently gave up sugar for life. I’ve made a post about my personal experience on quitting sugar with a special unique technique that helped me achieve that. I’d be honored to write a new post with original content especially for your website sharing my experience, of course if you’re open for guest posts.